The ELITEpro is a complete solution to pinpoint electric usage and quantify consumption by measuring, storing, and analyzing Volts, Amps, Watts, Volt-Amps (VA), Volt-Amps reactive (VAR), Kilowatts (kW), Kilowatt Hours (kWh), Power Factor and harmonics; up to 144 different parameters The ELITEpro also offers some power quality features such as the ability to view voltage, current and power waveforms in real-time when connected to a PC. The ELITEpro can be mounted anywhere and is available with a optional NEMA 4 rated enclosure. 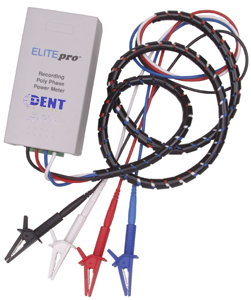 LINE POWER FEATURE: DENT's ELITEpro can now be powered from one of the phases of the service being measured. The Line-Powered ELITEpro option eliminates the need for external power at the job site and avoids draining precious battery power. The Line-Power option also allows you to maintain the fast 3-second sampling rate. This options is available on all new ELITEpros and as an upgrade to existing instruments. Contact the factory or your local distributor for details and be sure to read the Line-Powered ELITEpro Performance Update.